Danny Kinahan’s victory in South Antrim is an endorsement of socially-liberal brand of unionism, the UUP party leader has said. Mike Nesbitt told the News Letter that what the Province needs are “liberal, progressive politicians”. He also seemed to offer an acknowledgement of historic wrongdoing by the party, saying he wanted to see a renewed focus on economic development like that of a century ago – but “this time” without sectarian bias. Mr Nesbitt had turned up to cheer Mr Kinahan at the Valley Leisure Centre next to loyalist Rathcoole, as the votes were officially revealed at around 2am on Friday. “All politics is cyclical,” he told the News Letter. Mr Nesbitt said that backing the Good Friday Agreement (including “painful” measures such as early releases for paramilitaries and reform of the police) had been “right for Northern Ireland” in 1998. 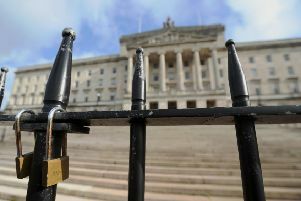 He added; “We did it, while the DUP stood at the gates. If they’d come in to the agreement, we’d have had a better agreement. “They profited politically – on a party political basis –, from that. And we suffered for it. Mr Kinahan himself had said that he hopes for “a new era, a new constructive type of politics for all”. He is seen as being at the liberal end of unionism, and was one of only four unionists to vote in favour of gay marriage during a recent failed motion on the subject at Stormont. By contrast, defeated opponent William McCrea (who is also a practising Free Presbyterian minister) is regarded as sitting at the opposite end of the spectrum. Party leader Mr Nesbitt said: “I think what unionist people what is political leaders who will stand up and be strong in defending, promoting and advancing the union – but at the same time, be fair to everybody. That’s what I want to be. “I want us to start talking about serious wealth generation, the way we used to 100 years ago. But this time, to make sure everybody gets their share; not to be sectarian or biased about it. He was speaking shortly before news came in that a second UUP MP – Tom Elliott – had been elected to the Commons. Mr Elliott is generally seen as sitting more towards the conservative end of the party, and was standing as part of a UUP-DUP pact in Fermanagh and South Tyrone.